Ah well, we do our best. But, yes . 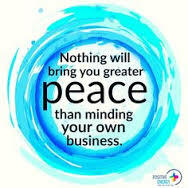 . . it’s a lot more peaceful to mind our own business (until we absolutely know that it is time to step in)! Peace . . . a special place for a settled soul. Peace is amazing. Another thing I’m working on…is minding my own business and not others. And just as important making sure other’s aren’t minding my business too.!! LOL this is so true!